Yes, this happened back in May of 2018 and I’m posting about it in January 2019. But is it ever too late to document your first trip abroad?? Abroad sounds like such a fancy word and such a fancy occasion certainly has no statute of limitations for posting it on your blog. 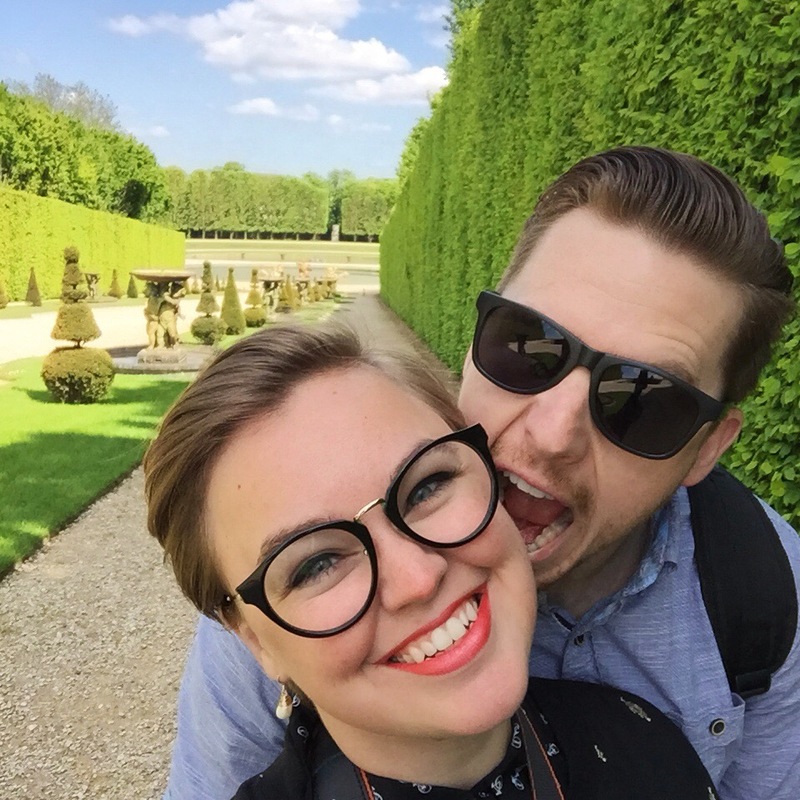 Paris was the perfect destination for two people that had previously never left the states. So much to do in one city and many of its people speak english. In a pinch, I know just a little bit of french- enough to understand signs and communicate at restaurants (all of the important stuff). Between the sites, food, weather, vibe, and general beauty of the city, we were smitten. 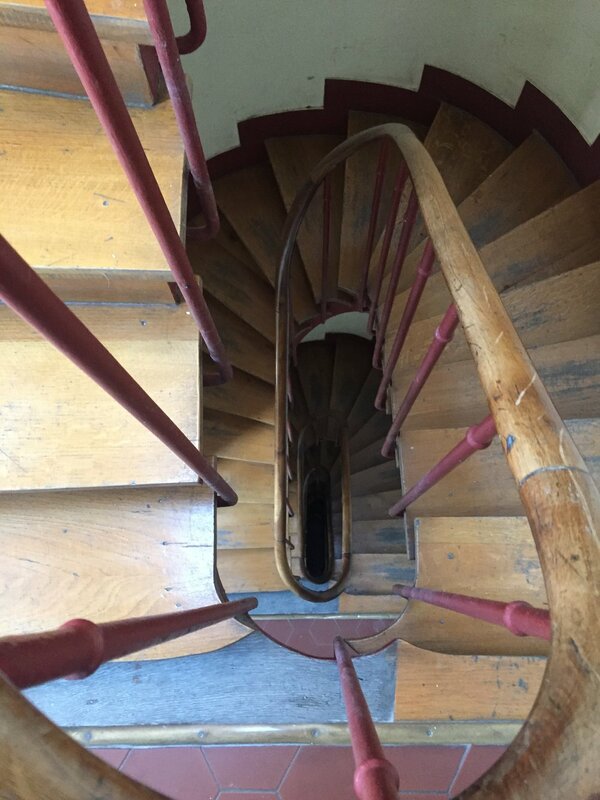 I’ve been told (indirectly via blog posts and people I stalk on Instagram that have been to France) that you should stay in an AirBnB when visiting Paris. I’ve never stayed in a hotel in Paris, but based on the single place we stayed in our total of six days in Paris, I recommend AirBnB. Specifically the neighborhood where our AirBnB. And specifically our AirBnB. Unless you don’t like climbing 5+ flights of stairs. But remember that 5+ flights of stairs gets your a 5+ flights of stairs view. And ours was lovely. Though I was so smitten with Paris that if our view was the back wall of another Parisian building, I probably would’ve loved it. We stayed in a lovely one bedroom on a side street of the 10th Arrondissement, just two blocks away from Canal St. Martin. 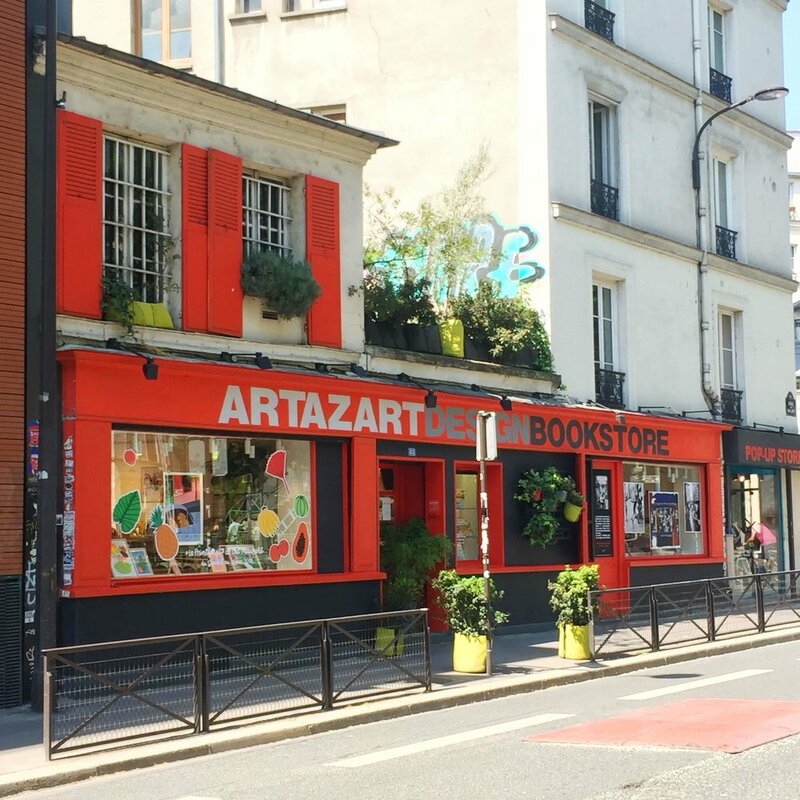 I stressed about finding a great location amongst locals, but also close to metro stops, shops, and good food (as if there isn’t good food all over Paris). This apartment delivered. We were far enough out of the city center for us to be surrounded by locals and not deal with tourist traps/prices but close enough that we had access to everything we wanted to see. Within a block or two, we had a metro stop, multiple grocery stores, bakeries, pastry shops, bookstores, boutiques, and a huge variety of restaurants clearly loved by the locals, as evidenced by the many delivery drivers hanging around our street waiting for orders. They had an espresso maker and varied selection of pods with tiny espresso mugs that we were obsessed with. We were powered solely by espresso all week. There were so many amazing vintage details (beyond the obviously “vintage” building itself) from the light fixtures to the furniture and pottery that looks like its been broken and put back together many times. Our host is very well-traveled himself and he had little tchotkes from all over the world decorating the place. It was the perfect vibe. Whenever we were there, we kept the windows open to listen to the sounds of the city, even at night when people were sitting outside the brasserie next door with their children until midnight. The view and the weather were both wonderful and we definitely didn’t take it for granted. Check out that adorable fridge. I’ve wanted to go to Versailles ever since freshman world history where our teacher described in detail the lavishness of Louis X!V and his palace. I couldn’t believe she had been to it and seen the Hall of Mirrors. I added it to my own personal bucket list. We got there fairly early in the morning, but it was already packed with an enormous line just to get in. I spent much of our time inside trying to get out of one packed room only to get to another packed room. It was certainly a test for my claustrophobia. But it was all worth it, especially for the Hall of Mirrors. We got some macarons and took them out to picnic in the vast gardens. Next time I’ll skip the inside tour and spend a whole day exploring the gardens. They were so large we only saw just a glimpse. And to think Parisians wanted this blight on their city taken down! It was amazing to see in person. I especially loved that if you had any sort of vantage point on the city or were in a fairly open space, you could see the tower off in the distance. Tip: The North side (by or across the Seine) was much better than the South side (with the greens). All of you that have posted pictures of the Mona Lisa crowded by throngs of people almost kept me from going to the Louvre. I expected it to be packed, but we were in the area early in the morning so decided to give it a go. Only the Mona Lisa had a crowd! The rest had loads of room to explore and take your time seeing everything. 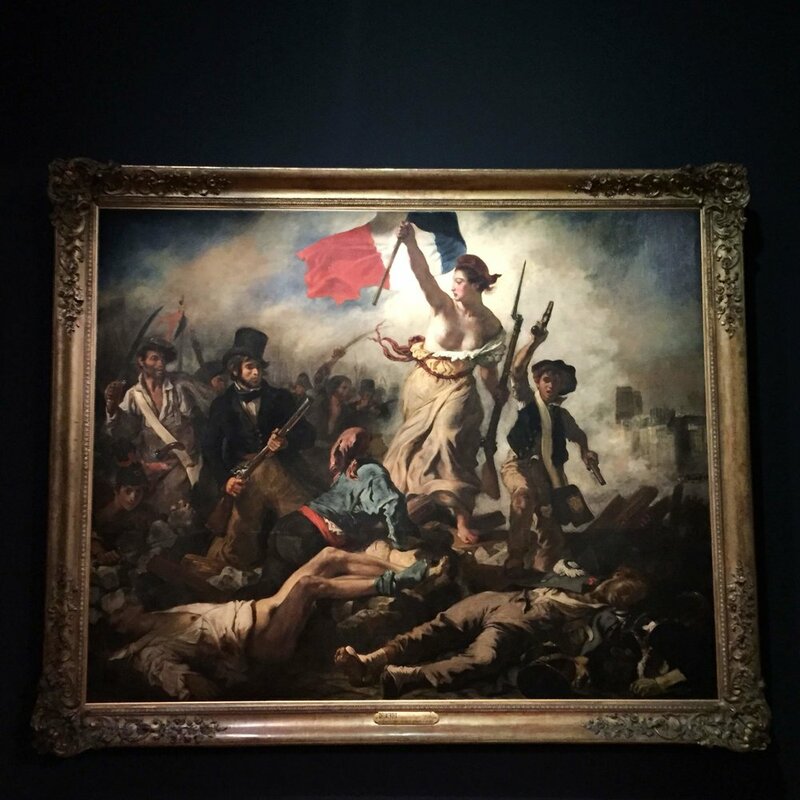 We lucked out and happened to be there during the Eugene Delacroix exhibit (thank goodness, because his museum was closed for renovations). Seeing his masterpieces and even his practice sketches was incredible. Don’t skip out on the Louvre if you ever get the chance to go. It’s incredible and we’ll definitely be back. On our last day in Paris, we slowed down. We got some pastries from Angelina and picnicked with the rest of Paris at the gardens. I love Paris’ dedication to creating beautiful open spaces and the people’s dedication to using them. I do regret not riding a carousel though. Next time! If we do another photoshoot, I think I’d like it done at Notre Dame. So gorgeous! Unfortunately we got there in the middle of a Friday afternoon so it was packed. We didn’t end up going inside or to the top, but we spent a lot of time looking at the outside. Next time we’ll give it the attention it deserves. The first place we happened to eat at was American. Very well done and we had a lovely server that wanted to chat all day about living in America. The best part was the art on the wall that had really really random english phrases like “rub along with wood.” Was that the french equivalent of Americans getting japanese tattoos that mean nonsense? Classic french bistro that’s open all day for coffee, breakfast, snacks, drinks, dinner, or dessert. Picturesque outdoor seating with a view of the canal. So good we ate their twice. Vegan vietnamese food, though we weren’t aware it was vegan on our first trip, that’s how good it was. Asian-french fusion and probably one of my favorite restaurants we ate at. I loved the whole style and vibe and the food was incredible. 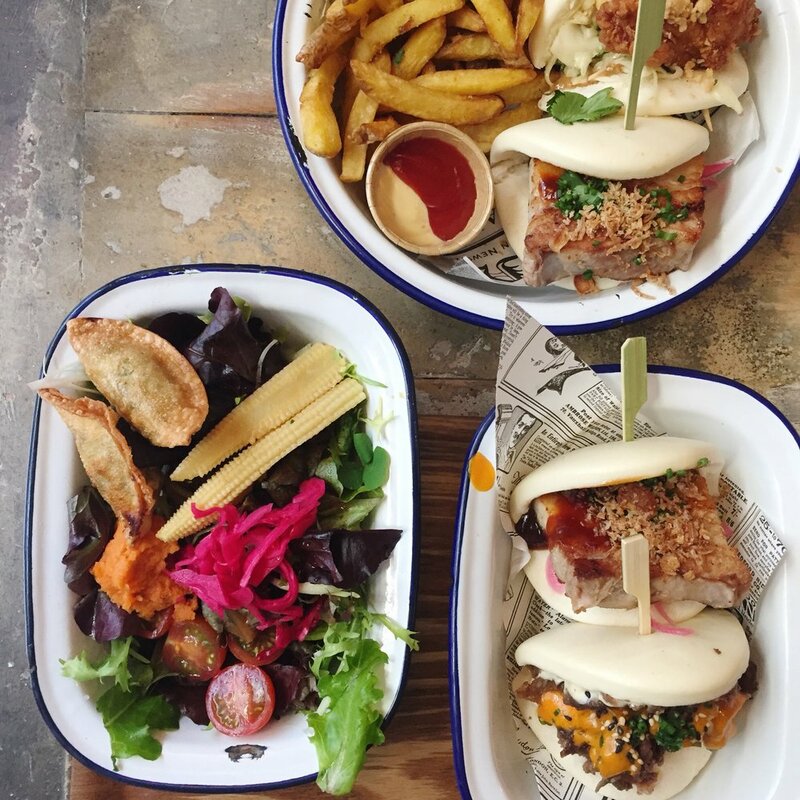 I dream about that bao. A walk-up creperie that makes the crepes in front of you and packages them up to go for you to enjoy them in a park were you can watch random families play petanque. Or at least that’s what we did. And it was perfect. 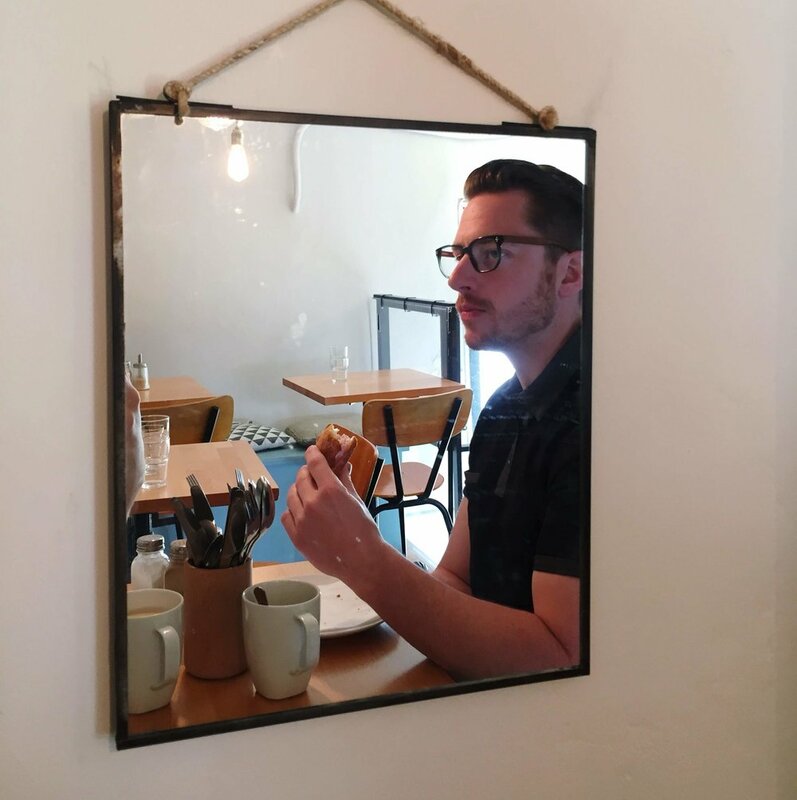 A tiny restaurant that can only seat 10 or less at a time with the tiny kitchen and pizza oven on full display. Possibly the best pizza I’ve ever had and the owner was so friendly. 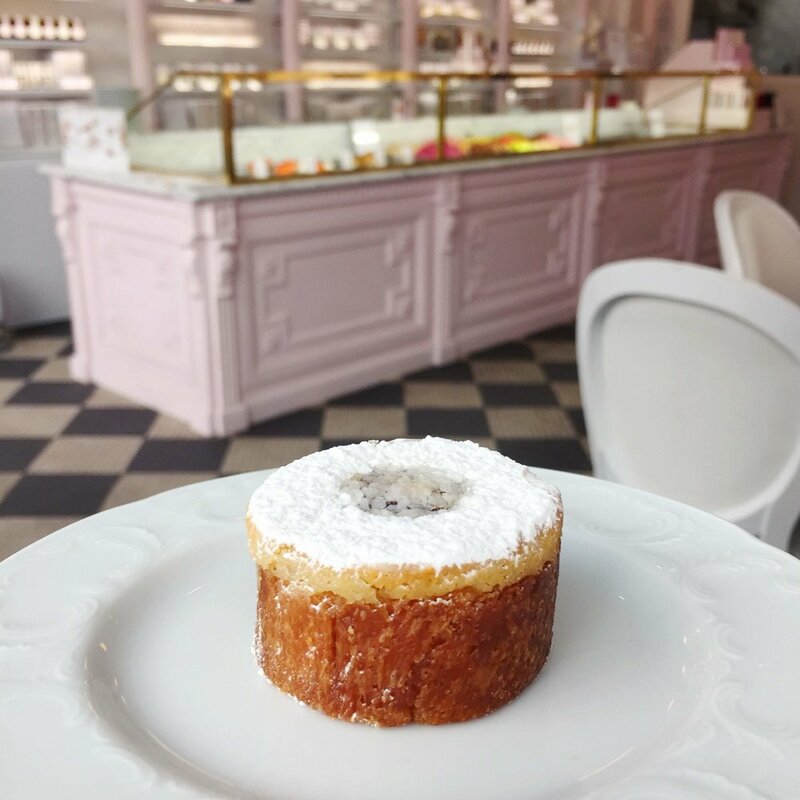 A lovely little cafe with your typical parisian cafe faire as well as local gourmet goods. Their seating is in an adorable tiny attic nook. We got sandwiches and coffee and took our time enjoying the atmosphere. I went here thanks to the cookbook Tasting Paris that recommended (then offered a similar recipe for) bostock, an amazing pastry that’s basically brioche, almond paste, jam, and powdered sugar all smashed together. This pastry shop had a very chain feel and it was probably the worst service we had on the trip, but boy was that pastry worth it. I heard about Berthillon while doing ice cream research forever ago for my own ice cream making so it was at the top of my food bucket list. A pleasant walk away from Notre Dame, this ice cream place is worth the hype! There was a line for the walk-up section, but we enjoyed a seat in their parlor. Their ice creams are absolutely heavenly. They had loads of flavors to choose from, all decadent yet light and excellently flavored. I can’t name every single place we went to because we ate small portions at a lot of different places so as to try as much as possible. I love that Paris requires restaurants to display their menus outside their shops so we had a chance to check out menus and see if it sounded interested before sitting down. We usually had croque-madames, crepes, or pastas in those situations where we ended up in a place we knew nothing about and for the most part, we did alright by that! We also stopped into many a pastry shop and got a few fresh baguettes from boulangeries. And we frequented the neighborhood MonoPrix for snacks and cheap bottles of wine for the evenings or our picnics by the canal. Bookstore just a block from our apartment that has a fantastic selection and some english titles as well as a great kids section. We bought some books as well as playing cards for picnicking along the Canal. Worth the hype with it’s fantastic selection of english books with a view of Notre Dame cathedral. It is crowded and packed so full I never even made it upstairs before it was time to move along. But don’t worry, I’ll be back. I loved this store and their carefully curated selection of art and hobby books as well as an amazing selection of beautifully illustrated kids books, fun prints, and unique gifts. Well worth a stop, even if you aren’t artsy. I loved the home goods store (though they also have a clothing store) and spent too much time in there trying to decide how many things I could reasonably buy and take home. Everything in that store is how I want my house to look. Beautiful jewelry and accessories with the loveliest women working there who were convinced they didn’t speak english well, yet spoke perfectly fine. I got a pair of gorgeous earrings here. Minimal and beautiful selection of handmade goods with a lovely shop owner. A bit too pricey for me but I would’ve loved to buy everything. I loved this place so much we had to go multiple times, though each time I had a difficult time deciding what to purchase because I wanted it all. Lots of great gifts from stationery to kitchen wears to accessories. I was so excited to see AirBnB started offering experiences that locals can offer. We looked into having private food tours or cooking classes, but ended up booking a professional photographer. Best. Choice. Ever. 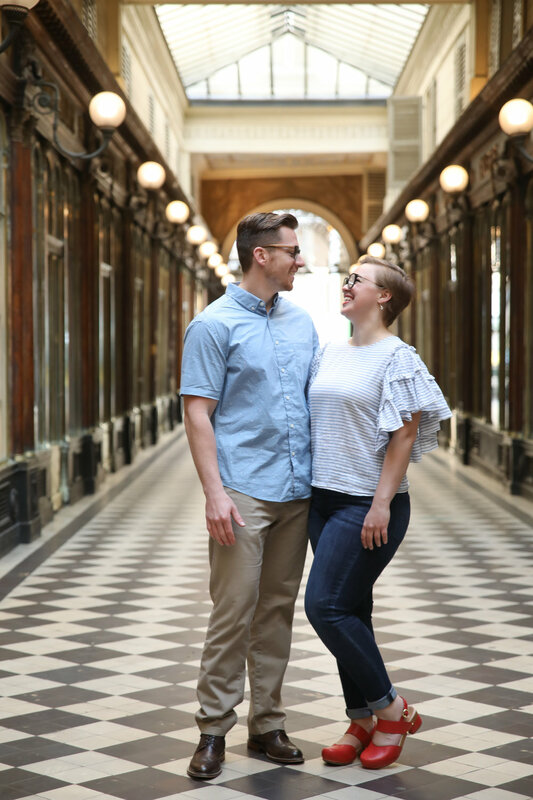 We hadn’t had photos of us in a long time, so it was good to get some new ones, but how cool to have these pictures of us in Paris that will last forever? 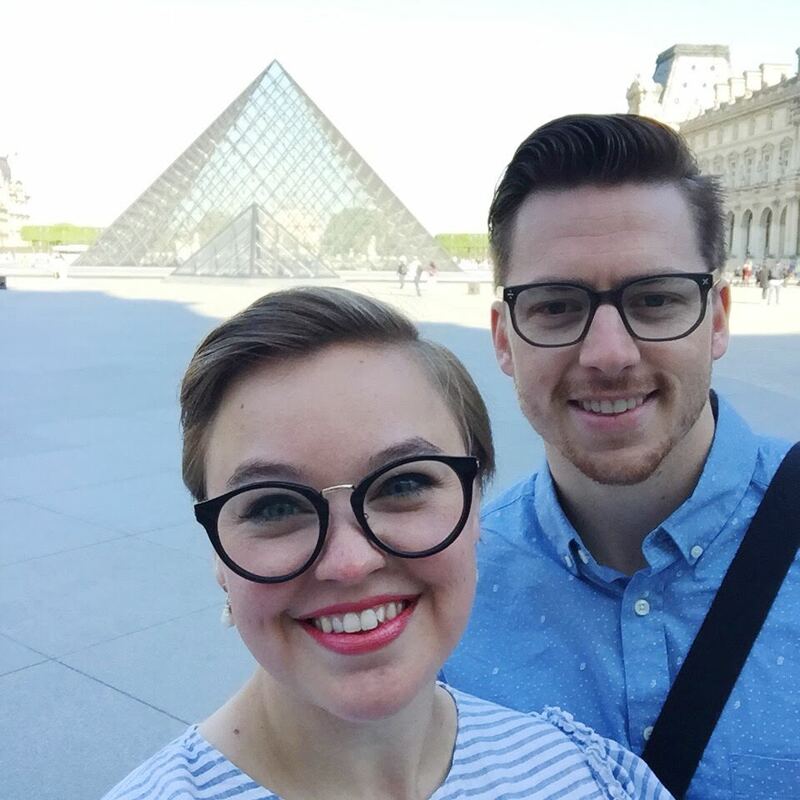 Our photographer met us bright and early around the Louvre and in one hour, we walked around a few miles and got a huge variety of photos. Plus, it was really cool to see Paris when everything was quiet and the sun was just coming up. Now we think we’ll have to do this whenever we travel abroad. It was well worth the money and I highly recommend it. Research, save destinations on a Google map, and save the map before you leave. This was a lifesaver especially since we didn’t get cell service. Saving my Google map of Paris meant we knew where all the metro stops were and what their schedules are. But the best part was that before our trip, I saved every restaurant and shop and site mentioned on travel blogs, etc. on my map. Then if we were in that neighborhood, I could pull out my map and see what places I’d saved that came highly recommended and were near us. I also saved our “must-do” list to Trello, giving each arrondissement their own list so if we took the metro to that area, we could cross everything off that list without having to get on the metro again. The arrondissements make planning so easy. All the research also helped to make sure we were eating at delicious locally-recommended spots instead of places that looked good (because everything in Paris looks good). Don’t eat in the super touristy neighborhoods. I’d heard this advice so we generally stayed away from places around the Eiffel Tower and Louvre with the exception of Angelina (worth it and not a tourist trap) and a few cafes/bistros we ended up at simply because we were there and starving. Those were the most (relatively) disappointing spots. 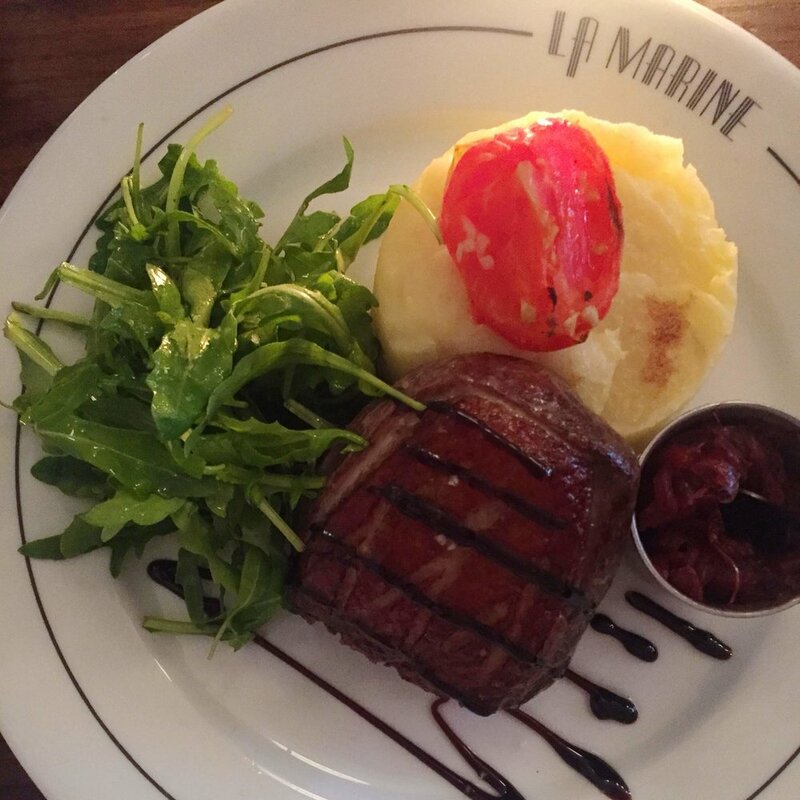 Just because it’s a bistro in Paris and it’s crowded doesn’t mean it’s good. Though it’s still decent because yes, it is Paris. The best food we ate was a few metro stops away from downtown. I’ll go a step further and say if there’s a lot of delivery drivers waiting by their vespas outside a restaurant, it’s a good sign. That means locals love it so much they want it delivered to them. Use the metro. It really is easy to get around, especially if you download a Google map of the entire city beforehand (see above). Pretty much all lines lead to the city center and there are connecting lines in between as well as larger stations around the city where you can connect to anywhere. And Paris is so walkable you can easily walk a little farther to get to those bigger stations if you’re worried about navigating train transfers (though there are clear signs everywhere so it’s not too difficult). I know if you look at a map, it looks insane, but I promise it’s much easier than it looks. Though I speak some french, it didn’t really come in handy on the metro but their color-coding and destination maps at each train and stop made it easy. We bought a book of ten tickets and that was nearly enough for our weeklong trip (though we could’ve easily walked to some places we took the metro to). I will note, however, that Uber’s are EVERYWHERE, even very very early in the morning when you need a ride to the airport, just in case you were paranoid about planning your trip back to the airport like I was. Though it’s not necessary, learn a little french. I brushed up on my french with Duolingo before our trip as well as memorized some common phrases that would come in handy (like how to ask someone to speak slower or if a business accepted credit cards or if someone spoke english or to order tap water, no sparkling). I found that 4/5 times, Parisians would respond to my french in english, knowing I was American and were kind enough to end my obvious struggling. However, they often showed appreciation that I took the time to be respectful of them and their country that I was visiting. Many people would say they didn’t speak much English but they spoke it better than I might ever learn french (so modest of them). It was only a problem a few times, more often the farther away from city center we got. Either way, starting things off conversations in stumbling french with a phrase I memorized beforehand and letting them speak english if they could certainly comes off nicer than constantly telling people “I don’t speak french” on the trip you’ve been planning for months. Spend more time exploring the Versailles gardens. We’ll pack a nice picnic, skip the crowded tours of the chateau, and enjoy the gorgeous outdoors. And hopefully next time Marie Antoinette’s hamlet will be open. More art museums. Now that we’ve checked the big sites off our list, we can spend money on the smaller or less well known sites and museums that we just didn’t have the budget for. I’d love to go to Delacroix’s museum and Orangerie and the Pompidou. Eclairs. 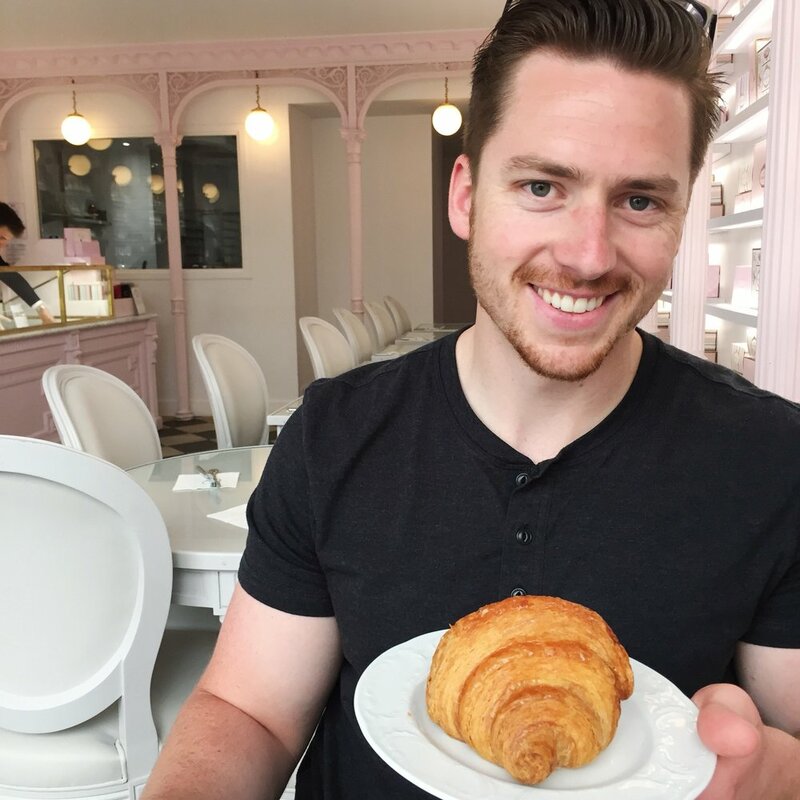 Can you believe I didn’t eat a single eclair in Paris? I’d love to find some choux pastry specialty shops and try loads of different kinds. Montmartre. We never made it up to see Sacre-Coeur and I’d love to see the view of Paris from there as well as explore the 1920’s artists and writers sites. Hop on a train and head out to small towns. I loved exploring Versailles and seeing the quieter places outside of Paris, so I’d love to see other smaller towns and get a little off the beaten path (and maybe be forced to actually use my french). Ride a carousel. There are loads of lovely carousels all over the city and I regret not just hopping on one. + We had been planning on a two-week long trip to Vietnam for Thanksgiving but after some unexpected big expenses, we could no longer afford those flights. So we were left with two-weeks of saved up vacation and a bit of extra vacation money. When I found ultra-cheap flights to Austin, we decided it would be the perfect weekend trip in December! And we were right. Maybe we'll make a trip to Austin in December every year. + I really loved Austin. It felt like the Portland of the south, and since Portland is my favorite U.S. city and Austin has amazing weather in December, it was absolutely lovely. Incredibly food (see below), cool people, quite a few bookstores (also see below), great weather, lots (of cheap things) to do. And it's so dog friendly! I loved it. Next time we visit, we're bringing the dogs so we can join the people who hang out in food truck parks with their adorable dogs. Bruce and Bernie would love it if we moved here. + My sister used to live in Austin, so when I asked her for recommendations, she immediately told me to get tickets to Master Pancake theater at the Alamo Drafthouse. It's a classic movie accompanied by a comedy show and we booked tickets without even knowing what movie they were showing. Oh man. We've been missing out on the glory that is "The Room" (Tommy Wiseau, not Brie Larson) but I'm glad we saw it for our first time with Master Pancake. So. Funny. Oh. My. Gosh. And ordering legit food (not the TGI Fridays level food that other dine-in movie theaters have) while watching was awesome. Then walking out of the theater to find the insanity that is 6th street on a Saturday night was pretty fun, too. + Barton Springs might have been my favorite part of this trip. It's been cold in Indiana and I couldn't wait to soak up some sun, even if it was a little colder than summer weather. Thankfully the day we decided to go to Barton Springs, it was warm and sunny and we got there early enough to catch the senior aerobics swimmers. The place was empty so it must have been a bit too cold for Texans, but we loved it. Once we were done swimming, we took a walk over to the dog-friendly area of the springs and worked on our tans while we watched dogs run around freely in the water. I could've sat there all day. + I firmly believe that any place with a river should build a place like this. Sacramento, get on that! The combination of fresh water and natural rocky bottoms complete with plant life with diving boards, lifeguards, steps, and ladders is incredible! When we go back to Austin, Barton Springs will be at the top of my to-do list. + Speaking of swimming, we loved the pool at the Sheraton downtown and had the whole thing to ourselves for an hour. We swam more on this trip than we did all summer and it was excellent. + Obviously we had to hit up the local bookstores! Austin has quite a few niched bookstores, as well as the mecca, Book People, downtown. Oh man, I loved Book People. I could've spent all day there, and Josh didn't complain when I nearly did. I found a number of books and magazines I haven't been able to find elsewhere and loved hunting around for their MANY signed copies. I spent so much time reading through all of the excellent staff recommendations. With Christmas coming, I only walked out with two books, but you can bet I'll be back there the next time we're in Austin and will budget to buy lots more. And hopefully we can plan ahead to be there for one of their author events they seem to host every day! + Not everything is bigger in Texas, but the Half Priced Books sure are. We went to a boutique near one of the chain bookstores, so we figured we'd stop in- it's fun to get an idea of a place based on what kinds of book donations they get. I couldn't believe how big the store was. At least twice as big as the biggest location in Indianapolis. Again. We spent way too much time there. + I almost feel guilty that our first stop in Austin was In-N-Out, but I'm a perpetually homesick California girl so get off my back. And that was the least busy In-N-Out I've ever encountered and I'm concerned for the judgement of Texans as they seem to not love In-N-Out as much as they should. So ungrateful. But anyway. It was amazing and I miss In-N-Out so much. Moving on. + For every city I want to visit, I have a list of places I want to go to. Whenever I come across articles in food magazines, recommendations from friends, city guides, etc. I add the places to these ever-growing lists so I am prepared should I ever visit. 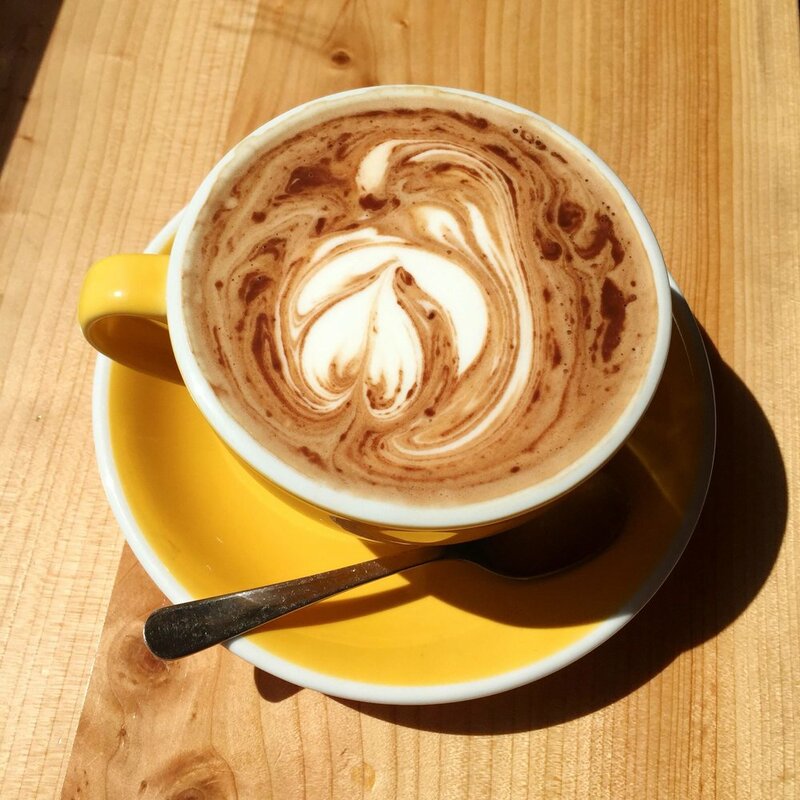 The first place I ever added to my list for Austin was Elizabeth St. Cafe. I discovered it in my graphic design days when I wanted to do branding for food businesses. Elizabeth St. was a prime example of incredible design, but it also featured a menu that seemed made just for me- pastries and Vietnamese food. So I had to check it out for myself while we're in town. We ate a lovely dinner of bún and banh mi with steamed buns and I couldn't stop raving about how cute the place was. I was a bit concerned, as reviews seemed to agree the place is overrated as it's overpriced somewhat Americanized Vietnamese food. They're totally right. It's not the greatest banh mi or bún I've ever had. But I was paying for the decor, design, and excellent service and I'd do it again in a heartbeat. If you need to take away my foodie card, I understand. We even went back for breakfast treats the next day. I highly recommend the everything croissant. + Torchys. Okay, so I grew up in California where tacos are everywhere and I've grown to believe that for the most part, they are nothing special. I don't often seek out Mexican food so I wasn't particularly excited to eat TexMex in Texas. We almost skipped Torchy's in favor of other more interesting looking food trucks. But we wanted a cheaper breakfast that had a breakfast menu for Josh and a not breakfast menu available for me (who doesn't love scrambled eggs) and Torchy's seemed like a good fit. Oh. My. Gosh. I want to live on the Trashy Trailer Park taco. And the green chile pork was excellent as well. It was the greatest breakfast I've had in a long time and felt so Texas, especially out under a mesquite tree on a sunny morning. We may or may not have gone to Torchy's again for a late lunch... No regrets. + Gourdoughs made us feel like the ultimate fatties. Holy wow those donuts are dense (and delicious). And we may have gone a bit overboard getting the concoctions topped with marshmallow sauce and giant chunks of brownie. I feel fat just thinking about it. Very good, but prepare yourself, my friends. + It's become tradition for us to get dessert to go and bring it back to our hotel so we can indulge while taking advantage of the TV and room we don't have to clean. This trip we got a few treats from Sugar Mama's, which might be the food I liked the least on this trip, but it was good. And the night we went to Alamo Drafthouse, we went to Voodoo down the street for donuts. I couldn't pass up a chance to get me a Mango Tango! Of course they did not disappoint. + But seriously, nearly every eatery in Austin is beautifully designed. The Peached Tortilla also made it on my Austin list during my graphic design days and I'm glad we stopped! It wasn't mind-blowing food and I'm a little confused about their name since it was mostly Asian-fusion and the "tortilla" implies Mexican-fusion but whatever. We loved the vibe and beautiful decor. And they convinced me to have a sweet breakfast of ultra-fluffy melt in your mouth french toast with miso syrup that I really enjoyed. + Our hotel was a short walk away from THE Franklin BBQ so we walked down one morning. We went. We saw the line. We turned around and left. Good thing neither of us are BBQ obsessed. + Hands down, Odd Duck served the best food we ate in Austin. Sorry Torchy's. I made a reservation on a whim after seeing it recommended by Bon Appetit and I'm so glad we did. 1) The service was amazing. They didn't just point me to the restroom, they walked me there. They didn't just tell me what dishes were corn-free (sucky allergy to have because corn is in EVERYTHING in America), they made an annotated menu with available substitutions just for me. 2) The food. Oh man, the food. A good chunk of the menu is vegetable based, which I normally wouldn't love but the descriptions made it sound amazing. At any other restaurant, I'm not sure I would've ordered an egg-based, broccoli-based, or squash-based dish but we did here and it was incredible. In fact, I almost wanted to order another butternut squash dish for dessert. But not to worry because they had a butternut squash Baked Alaska that was just as good- butternut ice cream on top of a spice cake and covered in a toasted meringue. Excellent and perfect for sharing. Sometimes I go to a restaurant and it makes me want to go back to my culinary school days when I was studying and experimenting with food all the time, and Odd Duck did that for me. I love when I fall in love and feel inspired by the food I'm eating. + You can bet we'll be vacationing in Austin again and we might even do exactly what we did on this trip. We had a lot of fun and definitely needed that quick weekend escape. + Josh now does a fair bit of travel for his work which has its ups and downs, and this trip was definitely one of the ups. We flew out west a few days earlier than his coworkers to spend the weekend exploring the city together and my oh my was it fabulous! + As a Northern Californian who loves visiting Seattle, I'm embarrassed to say that before this trip, I had not spent any significant amount of time in Portland. I believe that I'd driven over a bridge and through the city "just to look" on our way up to Seattle, but I'd never actually stepped foot onto Portland soil. Or asphalt. + It's been a little bit since we've been to San Francisco, but I think Portland may have replaced it as my favorite city. I'm not even going to apologize. Or try to explain that to my parents. 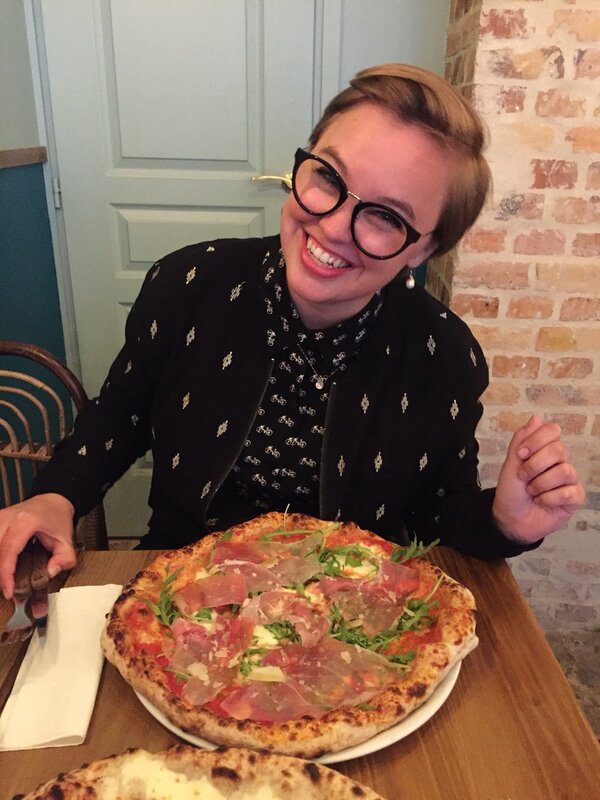 + Of course, like with any trip, my favorite part was the food. But this food beat the food of any other city of food I've ever been to. Yes, I've been to NYC. Don't interrupt. There were quite a few restaurants I had followed from afar for a long time, so I was thrilled to finally have the opportunity to try their fare. I've learned to not set my expectations too high, just in case that insanely popular no-reservations restaurant is packed and we can't get in or that the eatery really wasn't worth the hype. Lowered expectations simply make travel much more fun. But EVERY. SINGLE. RESTAURANT. blew. my. mind. Not once did we finish eating and say "That was alright" or "I guess we should've gone to that other place instead" or "We need to go back to the hotel IMMEDIATELY so I can use the bathroom" (don't pretend that's never happened to you). + VooDoo Doughnuts is DEFINITELY worth the hype. We got in to PDX pretty late so we went to the closest location to grab a box for breakfast the next morning so we could sleep in. I didn't realize just how long lines could get until we drove by their original location the next [Saturday] morning. Go to their second location at midnight. And then if you really want to be like us, do the exact same thing the next night. It will be worth it. Also get the Mango Tango. I still dream about it. + Pok Pok. I just. I loved. I told Josh that I was pretty open when it came to restaurants we should try (since there were too many good ones to choose from) but I NEEDED to try Pok Pok. Even if it was packed and we couldn't make it in we still had to try. So we walked up at 6pm on a Saturday night expecting at least a 30 minute wait. We immediately got a table. A quiet table upstairs. With an excellent waitress who made great recommendations and kindly explained EVERYTHING. The limeade is delicious. The vinegar sodas are strange but also delicious (don't let Josh tell you otherwise). The wings BLEW MY MIND. I know I keep saying that. Leave me alone. + I will now share with you all of the other food we ate because it was all amazing and deserves mention, but I understand that the food I ate is only interesting to me so I will keep it short. + We generally do a fair amount of shopping when we travel, but my favorite shopping experience to date has been the Saturday Market. Such a cool venue, so many unique (but actually cool) products, and delicious food to keep you going. That is shopping even Josh will love. It didn't hurt that there was a dog walkathon that ended right just up the river walk, so there were loads of adorable pups to ogle at while we shopped. First thing we found a jewelry maker who made etched brass necklaces and bracelets. I had to have the California bear pendant with waves etched onto it. Best souvenir ever (even if it represents CA not OR). + Best (affordable) boutique shopping I've experienced! I loved Tender Loving Empire, a unique gift shop + record label/store with loads of Portland themed goods. Their design aesthetic is on point. And thankfully they have a location at the airport because I regretted not purchasing a "West Coast" pin earlier in the trip but I was able to rectify the situation before flying home. + Green. Everywhere. I think that is why west coast cities will always delight me more than east coast cities- they embrace the green. Our hotel was north of the city and it was so cool to drive south along the river and look at the rolling hills of green trees. And the view heading south across the Columbia River and Government Island toward the airport literally took my breath away (momentarily, don't worry). I don't think a view had actually ever done that to me before then. Oh and "green" as in environmentally friendly is very cool too. + And last but certainly not least: Powell's. Of course we went to Powell's. We went to their main hub downtown on a Saturday afternoon and it was a claustrophobic nightmare. It was also a book lover's dream so I was very conflicted. They have an excellent selection and great prices for their used books and so many cool gifts and so many people taking selfies and standing around and not looking at books? I loved their Hawthorne location much more. It was smaller and more carefully curated and much less stressful and much less people and parking was significantly better so.... I won't apologize. Next time I'll try to make time for the Powell's hub on a quieter weekday. Either way, Powell's is amazing. + Portland, I love you. Most ardently. I will return to you and we will be together forever, if not in body then in soul. On our trip to Disneyworld last week, I was very dedicated to my cause and couldn't stop brainstorming and craving ice cream. Nearly every day, we tried a new ice cream treat that left me feeling inspired or gave me some new insight on ice cream-making. Thankfully Josh didn't mind me working while we were on break. Our first ice cream experience at Disneyworld had to be a Dole Whip float. There's nothing more appealing on a sticky hot day than a tall cup of pineapple juice and pineapple soft serve. I never go to Disneyworld without getting one (usually two). The ice cream is your typical soft serve texture- soft, melts fairly quickly, and has a fair amount of iceyness to it. I love to eat it very slowly to let it melt a little as I work, then sip up the juice with some melted ice cream. Yum! The next ice cream experience was the cookie ice cream sandwich from the Plaza Ice Cream Parlor. This was less of a study and more of a fun treat since the ice cream from this parlor comes from Dreyer's/Edy's and we all know it's decent but very mainstream ice cream. I mostly just wanted to try the cookies sandwiching the ice cream which were indeed perfect for sandwiches. Firm but soft, so you could take a clean balanced bite of both ice cream and cookie that wouldn't leave a mess of broken cookie and ice cream in your hand. The shop itself was adorable and old-fashioned and one of the ladies working there was happily singing as she worked. During our one "day off" from the Disney Parks, Josh and I spent an afternoon at Disney Springs for some shopping, eating, and seeing a movie. We found Vivoli Il Gelato and I had to check it out as I always have a hard time resisting trying a new ice cream shop. Apparently this location in Disney Springs is the second and only other location of an authentic gelato shop founded in Florence, Italy. I don't want to be rude but... really? This is what I have to look forward to in Italy? I mean, the ice cream was good. I don't mean to say that you should all avoid eating at this place, but I expected a bit more. The dark chocolate gelato was good and had an amazing texture, but the flavor wasn't as deep as I'd like. The stracciatella was much icier than the chocolate ice cream and I just didn't care for it too much. I had a few bites and then let Josh eat the rest of that side. If I were to go back, I think I'd try something a little more adventurous to see what more they can do. While we were at Epcot, the Food & Wine Festival was still going on which excited me greatly. Nearly every thirty feet on the World Showcase were food stalls serving up fare from around the world. We ate a few things from the Food & Wine stalls but after paying $5 for a sub-par cannoli the size of my thumb, I decided we wouldn't buy anything else. That was, until I found the stand selling caramel ice cream and cream soda floats! How genius! So we got our last treat from Food & Wine and weren't disappointed. The ice cream and soda paired perfectly, though I do wish both flavors had been more pronounced. It was the perfect afternoon treat and had me itching to go home and make these floats myself. I'm not much of a connoisseur of creme soda so does anyone have any suggestions? My favorite of all the ice cream I ate at Disneyworld was from L'artisan De Glace in France at Epcot. 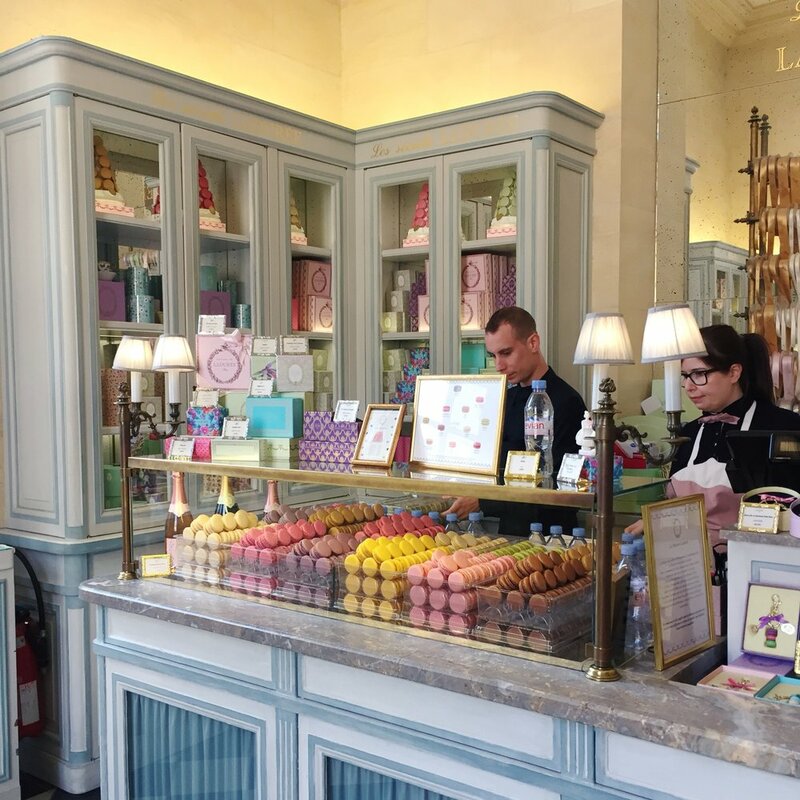 They serve 16 flavors of artisan french-style ice cream and I had a tough time deciding between the vanilla pear and chocolate, salted caramel, or the lemon ice cream with meringue. Unfortunately we could only select one flavor for the single serving cup, but once our server scooped, I didn't have to question why. The ice cream was so soft, his scoop barely had to work to create a perfectly formed tennis-sized ball. We chose the lemon with meringue and I have zero regrets. This ice cream was the most fluffy and soft ice cream I have ever tasted- it must have been churned at high speed as it was almost moussey. The lemon flavor reminded me of my favorite lemon cake- not very tart and very creamy. The meringue chunks were perfect, giving you a soft something to chew that paired perfectly with the lemon flavor. I definitely want to try adding meringue to my ice creams. It seems our trip to Disneyworld was exactly what I needed, not just because it was a fun break with family, but because the treats we ate gave me a good hit of inspiration that I was really craving. There are so many flavors I'm itching to make! + This past week, Josh and I were in Orlando for a trip to Disneyworld with my brother, sister-in-law, and two nephews. I love Disneyland and have been there a number of times, but this was all of our first times in Disneyworld and we had a blast. We spent most of our time in Magic Kingdom and Animal Kingdom as it not only had the most fun things to do for the nephews, but we loved it best ourselves. I particularly loved Animal Kingdom as it has loads of shade, animals to look at, and my favorite rides- Expedition Everest and Kali River Rapids. I'm also a big fan of their Asian themed section and got my only souvenirs there. + Of course we ate loads of good food. The past few times we've been to Disneyland we haven't had much money, but this time we splurged a little bit and ate well. It should come as no surprise that most of what we ate was ice cream, which I think I'll dedicate a whole post to so look for that. But we also had the chance to eat a french-inspired lunch at the Be Our Guest restaurant which was delicious and finished off with a chocolate cupcake topped with Lumiere's "grey stuff." It was really fun to sit in Belle's ballroom and then explore the library and gallery afterwards. Our favorite meal(s) were at Yak & Yeti in Animal Kingdom which served really good asian food. We went on Saturday night all together and then returned by ourselves two nights later, ordering the same exact dishes, because we loved it so much. + As much as I loved Disneyworld, I'm not a fan of Florida. We wrongly assumed that going in November would mean the weather would be nice. Instead we sweat our faces off all day long for five days straight and went to many shows because they were in air-conditioned rooms. I only own one pair of shorts that I hate wearing and I seriously regretted not bringing them. I think I prefer Disneyland shearly because I never sweat that much in any of my summer visits to Southern California. + One of my favorite parts of this trip was watching my nephew Wyatt and Josh together. Josh was so good with him, constantly playing with him and seemingly never running out of the energy to keep up with Wyatt's games. When Josh and I went to explore the parks on our own, Wyatt worried and kept asking where Josh was and when we met back up with them again, he would call out to Josh every few minutes to make sure Josh didn't get lost. THE cutest.